Cecylia Barczyk has achieved international recognition as a complete artist, successful teacher, and great humanitarian. She has given concerts, recitals, and master classes throughout Europe, Asia, North and South America and has appeared as a soloist with prominent orchestras including those of Amman, Baltimore, Beijing, Berlin, Boston, Berlin, Bucharest, Budapest, Jakarta, Leipzig, London, Moscow, New York, Prague, Rio de Janeiro, Salvador, Seoul, Shanghai, Sofia, St. Petersburg, Taiwan, Tel Aviv, Tianjin, Tokyo, and Warsaw. She has frequently performed on radio and television and has recorded much of the standard and new cello literature – as well as works composed especially for her – on the Muza, ICRecords, Melodya, and CRS labels. Ms. Barczyk began studying cello at a young age and soon drew the attention of great musicians. Among her mentors were Marian Miendlar, Kazimierz Wilkomirski, Natalya Gutman, and Aldo Parisot. She studied at the Chopin Academy of Music (Warsaw), Moscow Conservatory of Music, and Yale School of Music; receiving advanced degrees with highest honors. She won prizes in prestigious music competitions including the Danczowski Cello Competition (Poznan), Pablo Casals Cello Competition (Budapest), Tchaikovsky Competition (Moscow), Aldo Parisot International Cello Competition (Brazil), J.S. Bach International Competition (Leipzig), Cassado International Cello Competition (Florence), and W.C. Byrd Young Artists Competition (Michigan). Over the years Ms. Barczyk has received numerous awards and honors for her musical and pedagogical achievements. The Maryland Chapter of the American String Teachers Association twice voted her “Teacher of the Year” (1995 and 2004). The Tianjin Conservatory of Music (China) bestowed on her the title “Distinguished Honorary Professor.” The International Friends of the Cello Association honored her with the “Award for Great Achievements in Cello Music.” The International Music Tribute to Paderewski Committee honored her with the “Paderewki Award for Contributions to Society and Culture.” The Minister of Culture of the Republic of Poland presented her with a medal of recognition for outstanding musical achievement. 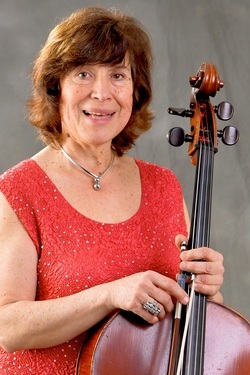 Since 1983, she has been Professor of Cello at Towson University (Maryland); continuing her solo career while educating young cellists from virtually every part of the globe. Several of her students have received top prizes in national/international music competitions (including the Kumho International Competition in Helsinki, the Young Concert Artists Auditions of New York, and the Corpus Christi Young Artists Competition). She is a frequent adjudicator of international music competitions, and a regular faculty member of advanced summer music courses in the USA and Europe. In 2003 she was appointed Artistic Director of the International Music Institute and Festival USA. In 1986, Ms. Barczyk founded the International Cello Festival at Towson University. The ICF has attracted attention for innovative themed-concerts, such as “Music for the Mind, Feet, and Soul,” “Music from Vietnam,” “Music from Iceland,” and “Music for Peace in the Middle East.” The 2006 festival included the world-premier of a composition by the American composer Jody Nagel for two cellos and orchestra (performed together with her daughter, Frances Borowsky). Ms. Barczyk has also been among the organizers of the World Cello Congresses in St. Petersburg and Baltimore. Most recently, Ms. Barczyk toured Vietnam (as a guest of the Ministry of Culture), China (performing Pre-Olympic Concerts), Germany, and Poland.